I’m always on the look out for new and tasty ideas for breakfast and lunch. Particularly lunch, as it can be a challenge mixing it up when you’re at work, without the freedoms of your fridge/toaster and oven to use as you wish. Sometimes lunches can get repetitive and it’s great to mix it up. Here’s the yummy goodness on gluten free toast. The reddish coloured one is the Mexican Pate – the other is the mushroom variety (also delish and very much like a regular mushroom pate). The Mexican pate is really quite creamy, and has a lovely, but delicate taste. Despite saying ‘spicy’ in the description, it’s actually not mouth burning, not suitable for breakfast kind of spicy. It’s just got spices in it., which give it loads of flavour. The red pepper kicks in and combines with this, and it’s certainly anything but boring. Since trying it just a few weeks ago, the pate has become a regular weekly purchase. Here I spread it quite thick on a DS Gluten Free Ciabatta Roll (also available from Real Foods) and packed it up with spring onions, lettuce and juicy tomatoes. A quick and easy lunch saver! The options, I’ve found are endless with this pate. Pop it onto Ryvita, or Rice Cakes. 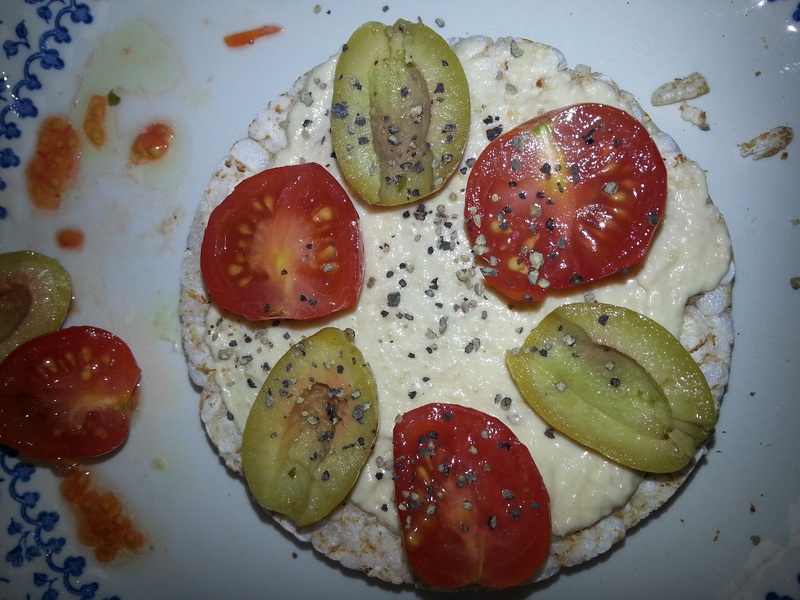 Here’s a lovely rice cake with hummus, olives and tomatoes – but you could really easily swap the hummus for the Mexican pate. Anyway, don’t just take my word for it, get over to the Real Foods website and buy some for yourself. It’ll change the way you think about lunchtime, forever! Next Post Friday Randoms … Have a Green & Sunny Weekend!